I’m back for another Five Minute Friday….on Sunday…better late than never as I always say. Life got crazy between Friday and now I am ready to WRITE (go figure that is this weeks word). Yeah that second one is a crazy thought for me. I’ve lived in this world where I felt swallowed by words and people. I send my words via text and tweet and facebook and many of them never even get answered and heard. I’ve been blogging for 3 years and there are tons of days where I feel like no one reads my words or even cares and really somedays I don’t care I write because it’s fun and cathartic for me but other days it’s discouraging. Then there are the 10+ drafts I have in my drafts folder that are posts that I NEED to write but I’m scared. I’m scared to hurt someones feelings. I’m scared that I’ll be misinterpreted. I’m scared that I’ll get sued (okay now that is a little exaggeration). I’m scared for the mere thought of writing about it will make me cry…and I’m scared to cry and scared to show my emotions. I’ve gone so long just hiding my feelings by laughing at everything…like everything was okay when it wasn’t I was sad, and lonely, and hurt inside and I’m scared for my words to be put out there. 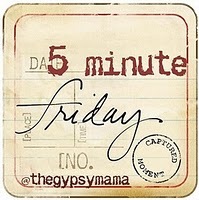 Now head over to Lisa Jo Baker’s Blog and read all the other awesome Five Minute Friday Posts! Thanks for writing. You’re right. it IS hard. And sometimes scary. And sometimes I feel unheard. Or unread. Or maybe after I write I WANT to go unread. But it’s worth it to write anyway. So thanks for being my FMF on Sunday buddy this week. and thank you for posting! even when you didn’t want to. Thanks! Glad I’m not alone in my feelings about writing! Rachel Rusticus @redeemingher recently posted…If you didn’t write. Writing definitely makes me feel better about things. When I’m not regularly blogging like I should (bad girl) I find myself going back to my journal and writing my more private thoughts there. I always feel better after. I definitely hold back on posts for the same reasons, I might break one out soon though… those type of posts always seem to get the best response because people actually express their opinion.